Many thanks to author Jane Doiron for giving me her book to review! 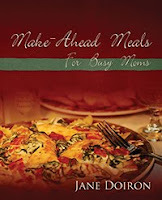 Make Ahead meals are not just for Moms who work outside of the home. It's a way of cooking that helps all families, big and small. It all comes down to a little planning. Make a meal or two in advance when you have some extra time. Then you'll be rewarded with quick, delicious home-cooked meals when you really need them! If Easy Fast Recipes are what you need, then THIS is your cookbook! There are plenty of yummy recipes to choose from for every taste buds. I'm excited about the Mini Bacon Quiches, Italian Sub Spiral Wraps, Teriyaki Chicken Wings, Cinnamon Bread, Pumpkin Coffee Cake, Brownie Cookies, Baked Manacotti, and Mini Meatloaves! I'm not a mom, but I still don't have the time or cooking experience to make elaborate meals. Yet, I do want something that is good and good for us. I don't have to look any further. This is the book! Bon Appetit! I am totally a busy mom and I need all the help i can get.